Note: I have completed this restoration, but I’m posting it in sections, so check back if you’re interested. 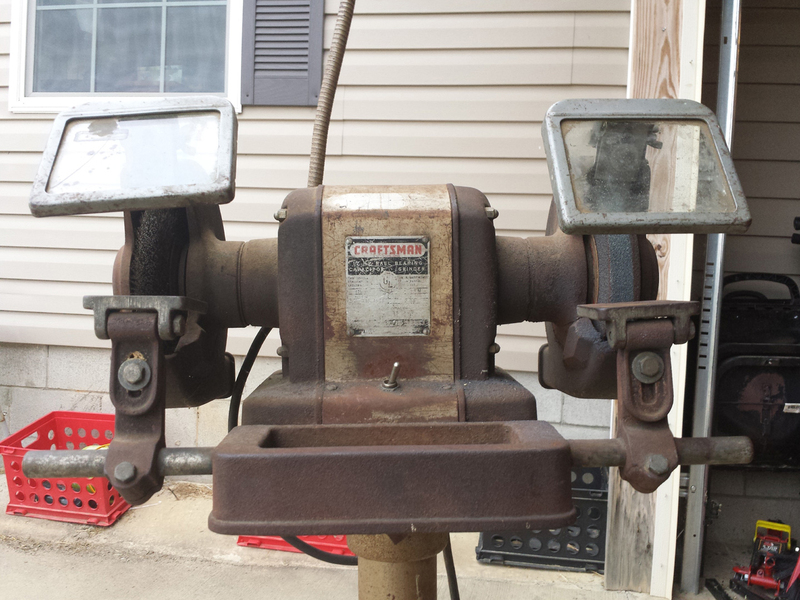 Craftsman ‘block’-style bench grinders are a popular series of bench grinders made for Craftsman starting in the 1950s until being discontinued in the late 1970s or early 1980s. They have a superb reputation for being over-engineered and having overall build quality and power equivalent to more expensive, higher-HP models. The ‘pre-block’ or ‘mailbox’-style grinders are the precursors to the proper block grinders, and they also possess all of the fine qualities of the block series. 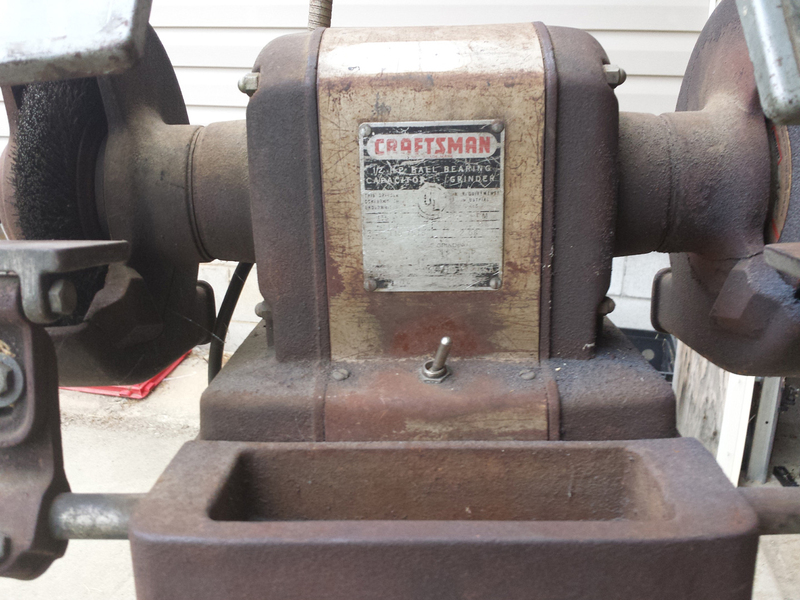 In this entry, I discuss my restoration of a Craftsman 115.7575 pre-block bench grinder (7 in. wheels). 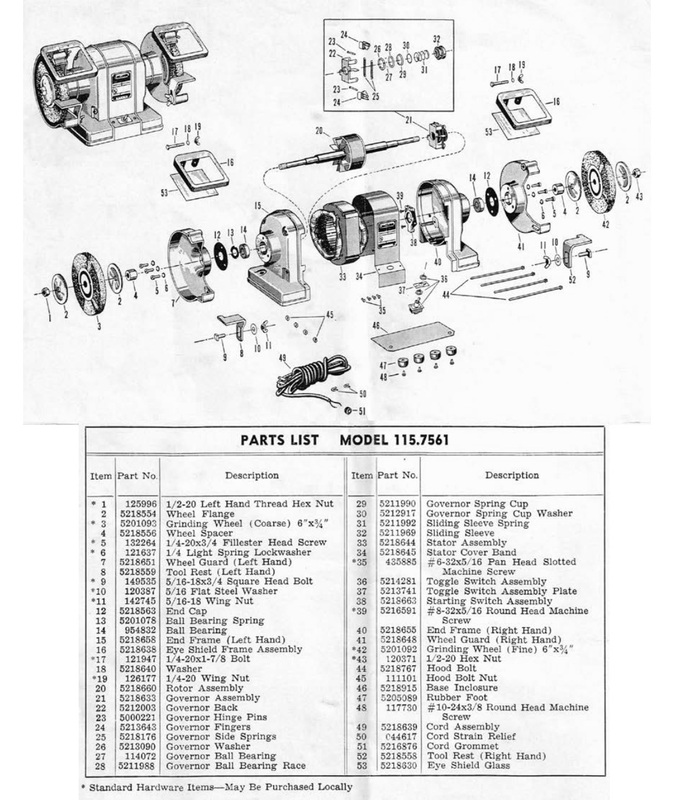 Parts diagram for a similar model. 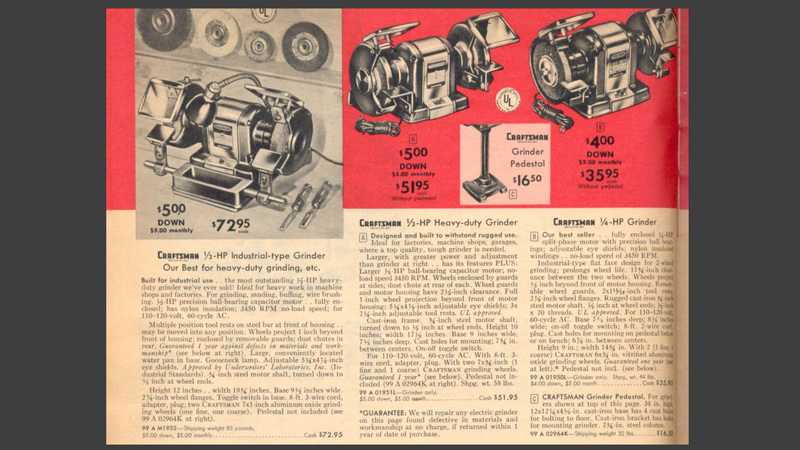 The grinder cost $72.95 new, in the 1959 Craftsman catalog. (Mine was built in 1958). They were built very stoutly, with a shipping weight of 85 lbs. 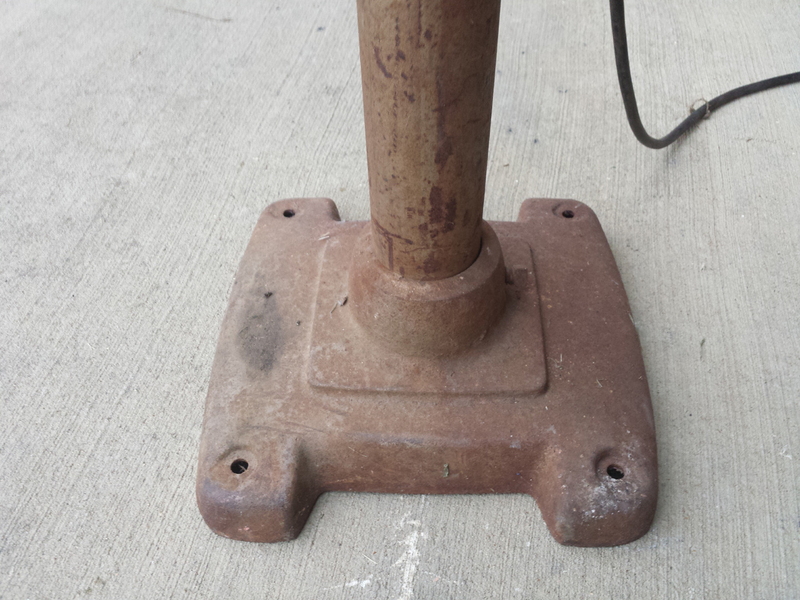 The 35 lb cast iron and steel pedestal ran a low $16.50. An online inflation calculator puts the cost of the grinder in 2016 dollars at $597.04 and the stand at $135.04. I think the stand is worth that, easily, and to buy a US-built grinder of this quality today would probably run you somewhere in the neighborhood of $500+, so those prices hold up well. Luckily for guys like me, these can be had for substantially less today (prices on par with their original cost, neglecting inflation). 1959 Craftsman Power Tools catalog excerpt. 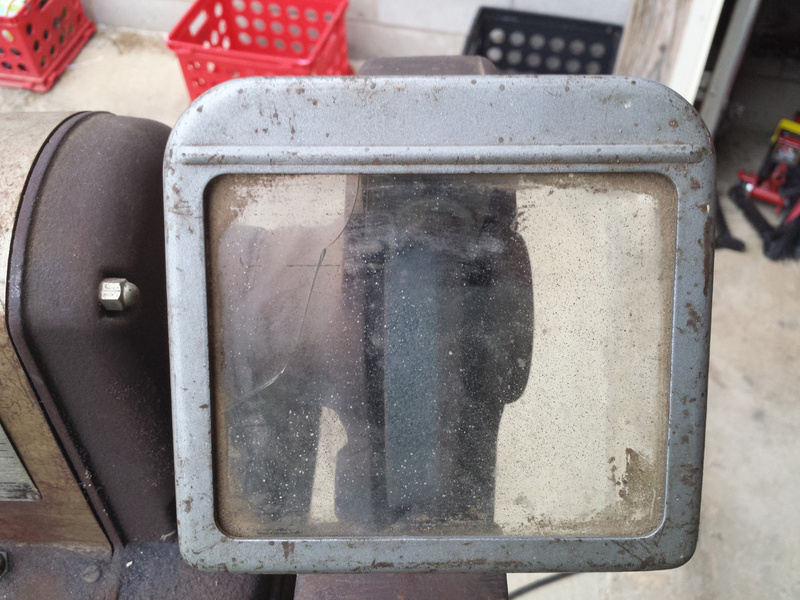 Once I got it home, I took a closer look and got acquainted with my project. The grinder is very heavy due to the cast iron construction. 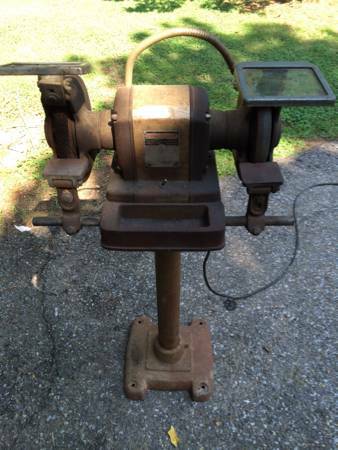 Mine came with the quenching tray, some beefy tool rests, cracked eye shields, a missing lamp socket (the lamp arm was present, though), and an original Craftsman stand. The grinder itself was in reasonably good condition – heavily-used, but it started right up. The bearings probably needed replacing (it slowed to a stop in 1 minute, vs ~3 minutes for my 397 series grinder), but they were not horrible. The previous owner was a mechanic from outside Memphis. As purchased, now in its new home. Missing the on-off switch label. You can see cracks in the inner wheel guard housings which need to be addressed for safety. The embossed ‘2 58’ indicated this unit was manufactured in February, 1958. The model number is 115-7575. 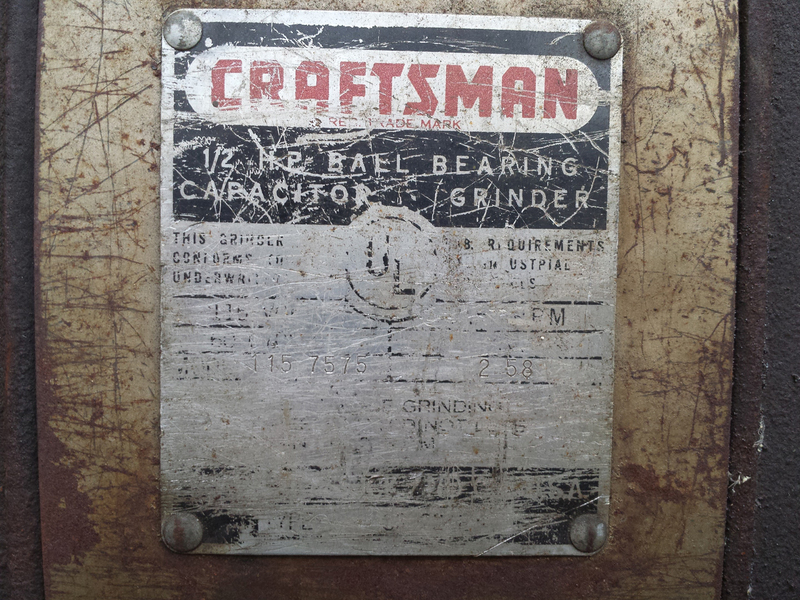 The 115 prefix in the model number indicates this grinder was built by Sunlight Electrical Manufacturing Co. / Packard Electric Co. for Craftsman. The label is pretty beat up. The eye guards are thick, laminated safety glass measuring 5″ x 3-7/8″ x 1/4″. The glass in both was cracked and needs to be replaced. Rear view. The cord needs to be replaced for my peace of mind. The rest looks pretty good. 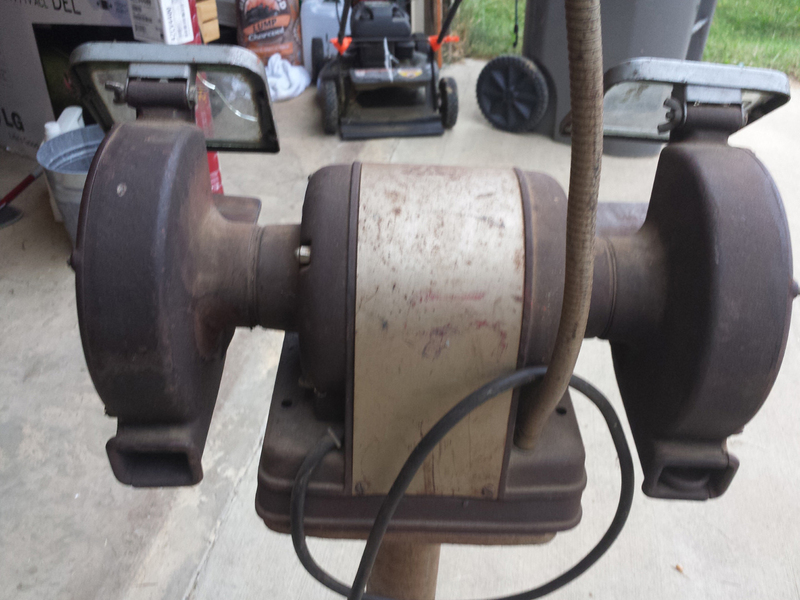 The grinder stand base is cast iron. The post is a steel tube. 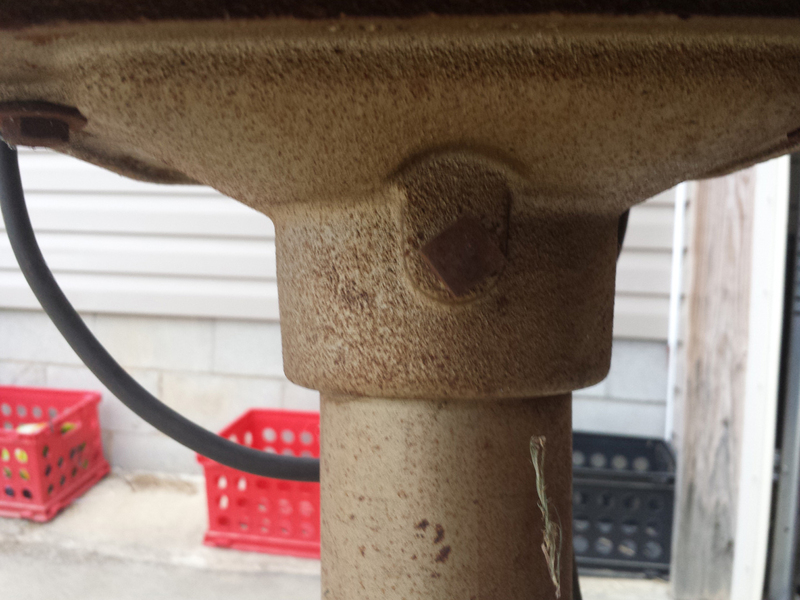 The top of the grinder stand is also cast iron. Check out the square-headed hardware. The inner wheel guards had some pretty major cracks. They were cast iron, so the choice here is either to braze them or replace them. They don’t support a lot of force (unless a wheel explodes) and some would say leave them be. I eventually replaced one (more on that later). Wheels can and do blow up, and if one did, I’d rather have intact wheel guards. As you can see, the previous owner apparently tried to weld or braze up one of the guards (not the other), with mixed results. Next up in this series: exterior restoration and paint. I will be adding to this series in coming days.